May May Ali: "My father was misdiagnosed for years." May May Ali has for many years been a passionate and energetic campaigner for people with Parkinson’s (PwPs). Her father, the former World Heavyweight Champion boxer Muhammad Ali, was diagnosed with the disease in 1984 and died on 3 June 2016. Since 2002, May May has been working in the US with the Parkinson Alliance. 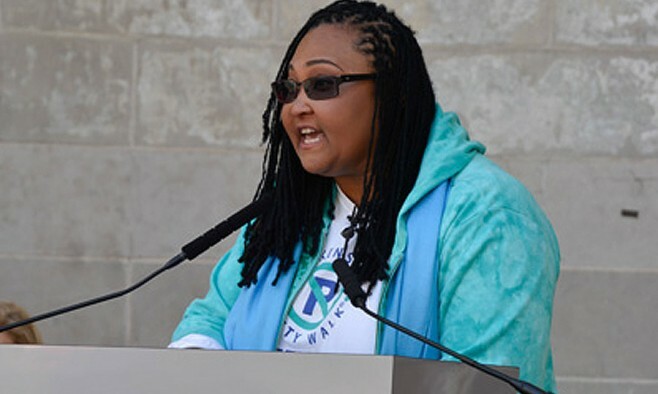 She is national spokesperson for the Alliance’s annual Unity Walk for Parkinson’s, and she regularly joins campaigners for the walking event in New York’s Central Park. You believe strongly in education and awareness as tools to combat Parkinson’s. Why? One thing I want to stress is that a lot of people with Parkinson’s go undiagnosed for many years. It’s very common for someone to go undiagnosed or misdiagnosed for anything between five to eight years. I think my father was misdiagnosed for more than eight years, maybe 10. And the reason is because most people don’t know the kind of doctor to go and see. They go to a general neurologist, which is not what they need. They need a neurologist with an additional two years of training to become a movement disorder specialist. PwPs need to interview their doctors and say, ‘Are you a movement disorder specialist and how many Parkinson’s patients do you have?’ They should ask the doctors if they know exactly how to treat them. And, of course, you want a doctor who allows you to be involved in the treatment process. Because Parkinson’s is a disease where healthcare professionals have to get a lot of information from the patient, to know which direction to go in. People struggle for a long time because they just don’t know what kind of doctor to seek out. They think a general doctor or a general neurologist is sufficient. It’s not. A European survey by the European Parkinson’s Disease Association (EPDA) showed that Parkinson’s specialists diagnose only one out of 10 PwPs. Exactly. But the thing is, too many PwPs aren’t aware of their rights. So, if you think you may have Parkinson’s and you’re doing your own self-diagnosis on the internet, try to find a Parkinson’s support group. I know a lady out here in Los Angeles who thought she had Parkinson’s, and she found a support group. To cut a long story short, she ended up finding out she was exposed to toxins at her job, and as soon as she left the job the symptoms went away. But just surrounding herself with people who understood, who she could share her thoughts with, it helped her get to the real story. How do Unity Walks help the day-to-day management of Parkinson’s? Everyone’s learning when it comes to Parkinson’s. There are different stages of the disease – new symptoms develop and progressive things happen. But if a family member, carer or member of the public doesn’t understand what’s actually happening then they’re guessing, and they may not handle that PwP correctly. You don’t know why PwPs look the way they look or why they’re acting the way they’re acting. And that’s where Unity Walks are so important. If you can provide a forum with the right people and the right information – and with it ways to improve PwPs’ quality of life and their communication in the home – then things get so much easier. When I was younger, my father used to have a shuffling walk, and he’d freeze sometimes, and we’d say, ‘Come on Dad, you can do it.’ But that is really not helpful. We found things to help through other people – we’d hear about the latest tricks to help him begin walking again. Unity Walks get PwPs talking directly with other PwPs and doctors, which helps them get access to all sorts of resources they never knew existed. When my dad was first diagnosed, he didn’t have these kinds of events to go to, where he could interact with the Parkinson’s community. That’s why I support them. A lot of people have this disease and they feel isolated. They feel they’re alone; but they’re not. Being a part of something can improve your life. Sitting by yourself at home is not going to do anything. You can have a better quality of life if you get involved, if you educate yourself and those around you. You may not think it’s going to get any better, but it actually can. What makes Unity Walks so special? For me, there are a few things: one is, PwPs getting their families and friends together and educating themselves and others about the disease. That is very helpful. There’s also the fact that these different groups of people are joining together to raise awareness and money – this is another component, and it’s great. You also have to consider the emotional and psychological wellbeing of even being a carer or a family member of someone with Parkinson’s. To just get involved in this kind of event, it’s really stress-relieving and positive. So there is a huge value in that. Then the event itself, the camaraderie and the unity of it. When I go to the US Unity Walk in New York, people are just very happy, very hopeful. They’re all one big team and one big family. That positive attitude can have therapeutic benefits for PwPs too. Yes, it’s just about encouraging people to be hopeful. Also, there’s a high correlation between attitude and Parkinson’s. I mean, just having a positive attitude and doing things can help massively. A lot of people, they’ll get Parkinson’s and think, ‘OK, I can’t run anymore or play the piano.’ But the progression is not always very fast, so you may be able to do a lot of great hobbies that you think you can’t manage. Because your life feels like it’s out of control when you’re diagnosed, you are in danger of automatically thinking the worst. You need to try to avoid slowing your life down. Thinking you can’t do something because you have Parkinson’s is not the way to go. For example, exercise – it has been shown to slow the progression of Parkinson’s and keep you healthier. So things like that – just your mentality, it means a lot. Diet can be the same. Anything that can give you more energy should be viewed as potentially helpful. What advice would you have for family members and carers of PwPs? Enjoy your time with your family members who have Parkinson’s. Live and exist with them in a very selfless manner. There are so many trials and tribulations in their journey. When you’re with them, make that time important to them. So find ways to do hobbies they enjoy, to spend time the way they want to spend it. Avoid stressing them out. You need to teach younger kids this as children can be stressful. They need to learn how to be patient with someone who’s dealing with Parkinson’s. This is a great Article Dominic, I met May May at the Walk. What a wonderful and down to earth lady she is. I agree wholeheartedly with all she says.